District attorneys across Louisiana are violating the state’s ethics laws by hiring off-duty police officers to write “diversion” traffic tickets that generate millions of dollars a year for district attorney’s offices. The scheme’s purpose is not to improve public safety but to pad the budgets of prosecutors, according to a complaint the SPLC filed today with the Louisiana Ethics Board. The complaint alleges that these off-duty officers operate a dragnet on local highways and roads, resulting in thousands of additional traffic tickets each year that threaten motorists with prosecution unless they pay hundreds of dollars to the district attorney’s offices to dismiss the tickets. The state’s ethic code prohibits district attorneys from leveraging the threat of prosecution in order to make money. The SPLC is asking the ethics board to thoroughly investigate the traffic ticket diversion programs, to reaffirm that district attorneys may not profit from the threat of prosecution, and to order the district attorneys to return the millions of dollars in profits they have extracted through their for-profit diversion scheme. The complaint names District Attorney Richard J. Ward, whose district includes West Baton Rouge, Iberville and Pointe Coupee parishes; District Attorney Joel Chaisson II (St. Charles Parish); District Attorney Gary Evans (DeSoto Parish) and District Attorney John DeRosier (Calcasieu Parish). These district attorneys are violating a section of the Louisiana state ethics code that prohibits public servants from abusing their positions to make money, according to the complaint. The complaint alleges that Ward hires off-duty police officers to issue traffic tickets that are different from the ones issued by on-duty officers. When offending motorists pay a fee of $175 to the district attorney’s office, the office agrees not to prosecute them or report their traffic violations to the Office of Motor Vehicles. 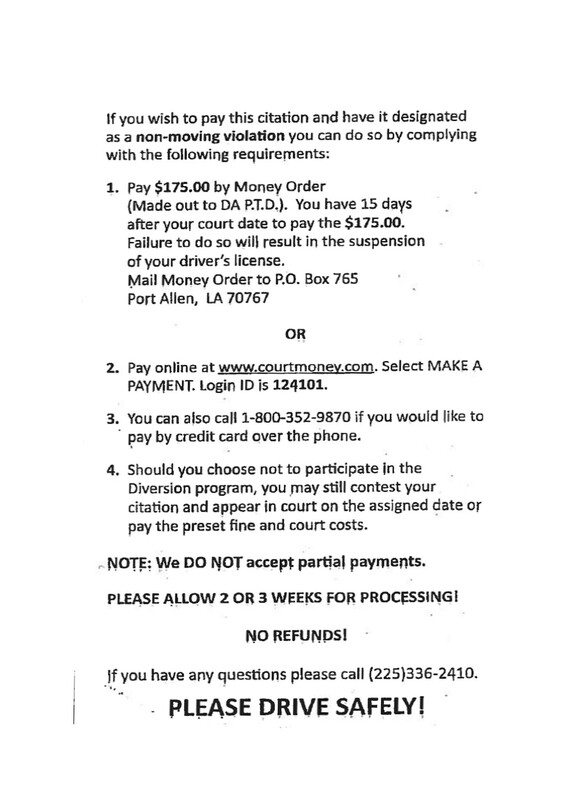 The diversion traffic ticket used by Ward informs motorists that they will have to pay the $175 diversion fee within 15 days of their court date in a money order to the district attorney’s office, or they will have their licenses suspended. However, district attorneys have no authority under state law to suspend driver’s licenses for non-payment of diversion fees, according to the complaint. Moreover, payment plans are not offered, and those who cannot pay in full face prosecution solely because they do not have the money to pay to have their traffic tickets dismissed. The amount of revenue generated through traffic ticket diversion fees is substantial. Last year, the Calcasieu Parish District Attorney’s Office generated $4.4 million from its ticket diversion scheme; the district that includes West Baton Rouge, Iberville and point Coupee parishes generated over $2.1 million; and the St. Charles Parish District Attorney’s Office generated over $1 million, according to the complaint. By contrast, the cost of administering the scheme is minimal. Last year in St. Charles Parish, for example, traffic ticket diversion only cost about $30,000 in salaries, office expenses and advisory fees, according to the complaint. The Louisiana legislative auditor estimates that statewide traffic ticket diversion and other “charges for services” make up about 30 percent of the district attorneys’ budgets. These fees represent the single largest source of revenue for many district attorney’s offices, according to the complaint. “These district attorneys are violating the ethics code by using their charging authority as a sword to extract operating revenue,” West said. * This story was originally posted on June 19, 2018. Since then, St. Charles District Attorney Joel Chaisson II has contacted the SPLC and said that of the approximately $1 million his office generated through the traffic ticket diversion program last year, about $30,000 was used for legitimate administrative expenses. The remainder, he said, was either used to pay overtime for the officers who issued the tickets, or was deposited into a bank account to be used in the future, in case the ticket revenue were to fall short of officer overtime costs. The SPLC has no reason to doubt the accuracy of Chaisson’s statement, but still maintains – as explained in the original complaint and this supplement – that no matter the laudable goals of how this money is used, the only amount a district attorney may ethically charge for a traffic ticket diversion program is the cost of administering the program, which for St. Charles was approximately $30,000. On July 24, 2018, the Louisiana Board of Ethics notified the SPLC that, upon review and consideration of the SPLC's complaint, it declined to initiate any investigation into the district attorneys' traffic ticket diversion program.